Whether in the busy city or in the leisure countryside, freedom is the eternal pursuit of people. Spirit Of Liberty, which integrates the leberal spirit and precision Swis watchmaking technology, is another tribute of Reef Tiger to freedom. The case of the watch is elegant, 41mm large size design is full of texture. This watch features Bauhaus style, adopts stainless steel case and bracelet, it is another classic work of Reef Tiger. Only experiencing the struggle can get real freedom. Spirit Of Liberty uses sword-shaped hands, which indicates that we are always ready to be for freedom struggle. People who often pursue freedom are pure and simple, the simple wedge-shaped hour markers of Spirit Of Liberty express its pure life attitude. In order to read the time more clearly, there is a circuit of track scales close to the hour markers. 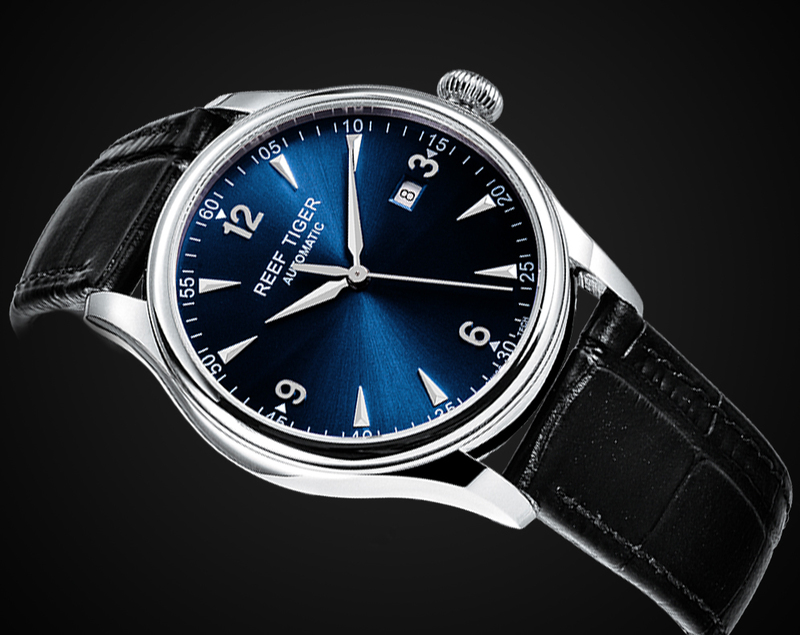 With the second hand crossing the dial, the freedom spirit tracks towards the distance. To match the hour markers and hands, Spirit Of Liberty adopts unique wedge grooves, each hour marker corresponds to a small wedge groove, while the markers of 3, 6, 9, 13 corresponds to the grooves on the bezel. There are shoulders protecting the crown, coupled with curved lugs, you will feel more comfortable to wear, also make the whole watch generous.